Last March, Shannon Watts tweeted a complaint about United Airlines. Watts had observed what she believed to be poor treatment from a United gate agent towards several other passengers and she took to Twitter to voice her displeasure. The tweet went viral and eventually made national headlines. Never mind that Watts only witnessed only part of the incident and had some of her facts wrong. (This thoughtful post from One Mile at a Time clears that up.) Or that United didn't help itself with its poor initial response. What's scary is this type of viral complaint can be a PR nightmare. So what can companies do to protect themselves? I did a study of customer complaints on Twitter to find out and one very clear answer appeared. Here's what you need to do to prevent 80 percent of those complaints. 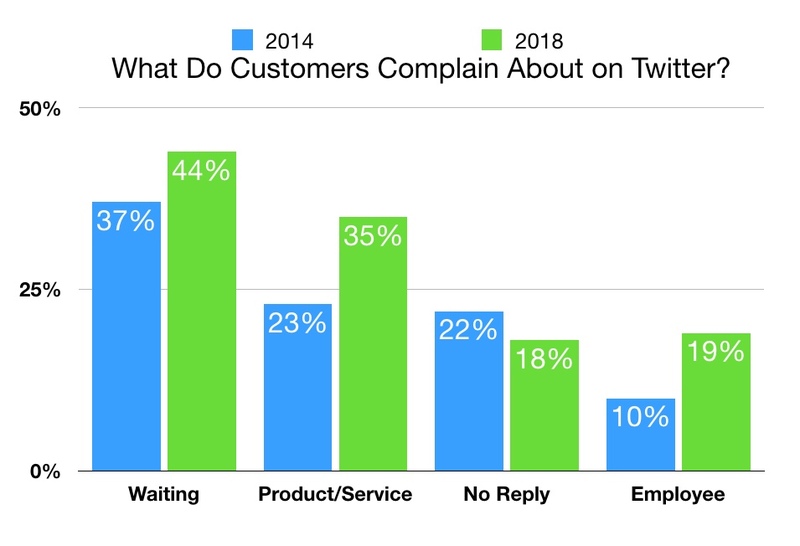 I did a similar study in 2014 to find out what customers complained about on Twitter. You can find those results here. Social media use by customers has risen since then, so I decided to replicate the research to see what has changed. Only obvious complaints were included. For instance, the #customerservice hashtag also has a lot of job postings and customer service advice articles, so I left those out. There's also a clear limitation to this study. Not every customer who complains uses a hashtag, or one that is consistently popular. So it is a possibility that my results are a bit skewed. Finally, for background, a 2017 study from Sprout Social found that 46 percent of people have used social media to complain about a brand. My own study on consumer response time expectations revealed 40 percent of customers use Twitter for customer service. There's one insight that really jumped out—80 percent of complaints on Twitter were an escalation. This means the customer previously had contact with the company via a different channel (phone, in-person, email, etc.) and had not received a satisfactory resolution. This makes it clear that the best way for businesses to prevent these types of complaints is to get it right the first time. Unfortunately, many companies do such a poor job serving other channels, they effectively train customers to use social media. Number one on the list is waiting for a resolution. These customers experienced some issue with a company and felt it was taking too long to get fixed. This angry tweet could have been prevented if the initial phone complaint had been handled to the customer's satisfaction. The third most popular reason customers complain on twitter is the customer never received a response to another contact. This customer tweeted about a product issue because she's still waiting for a call. The company probably could have prevented this tweet by (a) fixing the issue or (b) responding to her request for a call. Many public tweets are a customer's way of venting about a service failure. Quite a few tweets aren't even specific about the issue or what resolution the customer is seeking. One thing you can do is trace the social media complaints your company receives. This can apply to Twitter or any other social media channels. What are customers complaining about most often? Can you address the root cause? For example, one company identified a number of complaints were all connected to the same process. They are now fixing that process to help improve customer satisfaction, which in turn should reduce complaints. There are also a few courses on LinkedIn Learning to help you develop your social media customer service skills. You'll need a LinkedIn Premium account to watch the full videos. You can get a 30-day trial here or access the training through your Lynda.com account. Many small business owners hope Google will bring in more customers. Some try to advertise using Google Ads. Others wade into the mysterious world of search engine optimization (SEO). The latter often involves hiring an internet marketing wizard who makes strange suggestions for your website. There's another way Google can help you bring in more customers. It's easy and it's free. Let me show you how this works. I'll be arriving in Watertown, South Dakota tonight to speak at a Watertown Convention and Visitors Bureau luncheon tomorrow. Wouldn't you like your business to be one of those top choices when a customer searches for something relevant? Notice Google prioritizes three options. It shows each one on a map. At the bottom is a link labeled "More places" where I can search for additional restaurants. All of the additional search results, including TripAdvisor and Yelp's "Best 10" lists appear in the search results below this box. That's pretty good visibility to a prospective customer. I'll see even more choices if I click on "More places" or click directly on the map. This also reveals a larger map that shows where each business is located. The good news is these restaurants did not pay for advertising to get listed there! These search results come from Google My Business. Companies can claim a free listing by providing some basic information such as your business name, address, phone number, business category (restaurant, etc. ), and website. It's also a good idea to include your hours of operation. One word of caution—make sure you keep this information up-to-date. You want your customers to know if you change your hours of operation, update your restaurant menu, or move to a new location. Customers can see more information when you click on an individual business listing. Here's what I see when I click on the listing for Guadalajara Mexican Restaurant. Notice the photos at the bottom. You can upload photos of your business to your Google My Business listing and Google will display them alongside photos contributed by customers. This is an excellent way to visually entice people to pay a visit! Relevance refers to how closely your business matches what a person is searching for. The best way to improve your results is to make sure your Google My Business listing is complete and accurate. Prominence is Google's estimate of the business's popularity. There are several factors that contribute to this. A big one is the number and quality of Google reviews. Reviews, my friend, can be used to your advantage because they are often overlooked by big businesses! Google review count and score are factored into local search ranking: more reviews and positive ratings will probably improve a business's local ranking. OK, so it's great to have lots of five-star reviews. No surprise there. Some businesses go to great lengths to get good reviews. They provide incentives. Employees are implicitly encouraged to engage in survey begging. Do yourself a favor and skip those gimmicks. Pressuring customers for good reviews can hurt service quality. There's another way to improve your reputation that customers will appreciate. This restaurant has a terrific overall rating of 4.4 stars (out of five). Now, some business owners might freak out because there are a few bad reviews. The first review shown is only three stars and is somewhat critical. This is actually a plus! That's because a few negative reviews can make a business more trustworthy. Customers are wary of any business that has all positive reviews since it raises suspicions that the reviews may be fake. There's another plus here as well. Notice the response from Carlos Vega, the manager. Vega responded quickly, apologized without getting defensive, and invited the customer to return. This tells customers that management is listening to feedback. Presumably, the restaurant is using this feedback to continuously improve. These Google My Business listings are for individual locations. Most large businesses I see fail to respond to customer reviews. That's because social media is typically handled at the corporate level. Here's where the personal touch of a small business can really shine. Get your Google My Business listing and make sure it's up-to-date. Learn how Google determines business rankings. Of course, there are other places a customer like me might search for a business. The big ones are Yelp and TripAdvisor and your business should have a presence there, too. Each offers a free business listing. My online training course, How to Serve Customers Using Social Media, can help you make sense of them all. You'll need a Lynda.com account to access it, so here's a 30-day trial if you're not already a subscriber. Al Hopper, COO & Founder of SocialPath Solutions. A recent experience highlighted the evolution of social media customer service. I was traveling from San Diego to Milwaukee, connecting through Dallas. My American Airlines flight from San Diego to Dallas was cancelled due to weather. A long line of customers trying to get re-booked formed in front of the gate agent. Another group of customers pulled out their phones and dialed reservations, hoping to get a live agent without waiting on hold for too long. I went to Twitter and sent a direct message to @AmericanAir. Fifteen minutes later, I was booked on a later flight to Chicago, which was a good alternative airport for my destination. My trip was back on track with minimal effort. Meanwhile, a long line of passengers were still waiting to get help. To learn more about how companies like American Airlines are leveraging social media, I turned to Al Hopper, the COO and co-founder of SocialPath Solutions. His company provides social media engagement and customer care solutions for its client companies. Hopper was recently named one of ICMI's Top 50 Thought Leaders to Follow on Twitter and is a co-host of Twitter's weekly #custserv chat (Tuesdays, 6pm Pacific). In 2016, Hopper was named one of Conversocial's Top 30 Most Influential People in Social Customer Service. Q: Outsourced social customer care might be a new concept for some of my readers. Can you tell me a little about SocialPath Solutions and what it does? "When we were formed in 2014, most companies were using social media agencies to do a lot of marketing push, but not a lot of engaging. SocialPath was created to put the social back into social media. "A lot of marketing companies don't want to do that. They want to create a campaign, plug it into an automated schedule, and hope it goes viral. "But there's a real limitation to that approach. One retailer had set up a marketing campaign to tweet special deals on Black Friday. Each tweet contained a link back to the retailer's website, but the website crashed in the middle of the campaign. Customers started tweeting the company to let them know and ask for help, but there was nobody monitoring the Twitter feed so these customers couldn't get a response. Meanwhile, the next automated marketing tweet was sent out, making the company seem like it was deliberately ignoring its customers. "SocialPath Solutions helps with that engagement piece. Even if you're already working with a marketing agency they're probably not engaging with your customers. Or if they do, it's really limited. We can provide scalable access to 24/7 social customer support." Q: Social media customer care is a struggle for many companies. What are some of the major roadblocks that you see? "Scale is a big one. It takes most companies a minimum of $500,000 to staff a social media team 24 hours a day, seven days a week. "Think about a small team with perhaps two agents per shift and a supervisor. What happens if someone calls in sick or wants to take a vacation day? How do you build in time for training or staff development? And how do you ensure there's coverage every day, all day? "That might be possible for a large or mid-sized company, but a small business has no hope of being fully present on social media because they're already strapped for time. "Even if you get the staffing part down, you need to invest in a platform that's robust enough to allow you to engage in active social listening and can generate the appropriate analytics. "Analytics are key. A lot of business leaders look at customer care as a cost, including social, so you need to be able to get executives to understand that social customer service is really marketing. "Outsourcers like SocialPath allow companies to minimize their upfront investment by taking advantage of our ability to help you scale. We have a talented team of social media experts and have already invested in robust platforms to manage social customer care effectively." Q: You mentioned that social customer service is really marketing. Can you give me an example that's different than traditional advertising? "Let's say your company is a regional retailer with a network of stores. A loyal customer who has moved out of your region connects with your brand on social media and says, 'I miss you!' Having a social media presence allows you to respond and say, 'We miss you too! Did you know you can shop with us online?' You can share a link and track it to connect that interaction to sales. "A lot of fast food restaurants have had big wins like that. The most recent example is Wendy's with their 'never frozen' campaign. Organic engagement just happened, the news caught wind of it, and then suddenly it went viral. (Side note: Adweek put together this great recap.)" Q: How should a customer service leader get started if they want to engage customers on social media? "The first thing you've got to have is a plan. What are the potential types of contacts that are going to come up? You can use previous contacts from other channels (phone, email, etc.) as a guidepost to help with your planning. "You should also consider what sorts of messages you aren't going to respond to. Someone might complain that your website isn't loading properly, but in reality they just need to clear their cache, restart their browser, and everything will be working fine. But if 100 people complain about your website, you'd better have a way to respond internally and externally." Q: What else do you want business leaders to know about social media customer service? "People are going to be talking about you whether your brand is present on social media or not. So you're never controlling the conversation, you can only contribute to it. "Executives sometimes worry about a service failure going viral on social media, but if you think about it, all customer service channels now have that potential. "In the last few years, people have posted recordings of bad phone calls, shared videos of in-person experiences, or posted emails or chat sessions. Those used to be exclusively one-on-one interactions, but now they're easy to share. "Another concern we hear a lot as an outsourcer is business leaders are leery about entrusting their social media to another company. But it's really okay to outsource social media if it's done right. You just want to make sure you find a provider that takes the time to become a true partner with your business. "This is the same consideration for outsourcing any aspect of your customer service, whether its having another company answer your phone calls or hiring a delivery company to deliver orders to your customers. Anyone that connects with your customers should be invested in providing a great experience, no matter what channel it is."